IF YOU’RE LOOKING tasty, authentic-tasting Thai food at reasonable prices in the heart of Bangkok, look no further than the small and cosy Metta Eatery & Bar at the Maitria Hotel Sukhumvit 18 – A Chatrium Collection. 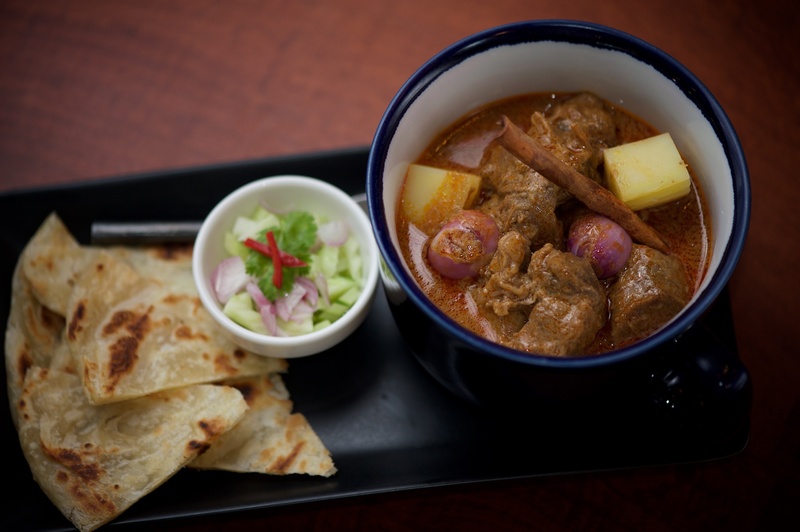 Tucked away among rows of leafy, shady trees in a quieter soi (by Sukhumvit standards, anyway), Metta borrows the Sanskrit word for happiness and honours it with simple but hearty Thai dishes that will appeal to both local and foreign palates. You can thank head chef Sarawat Im-sup, whose culinary experience spans more than 20 years at five-star chain hotels. 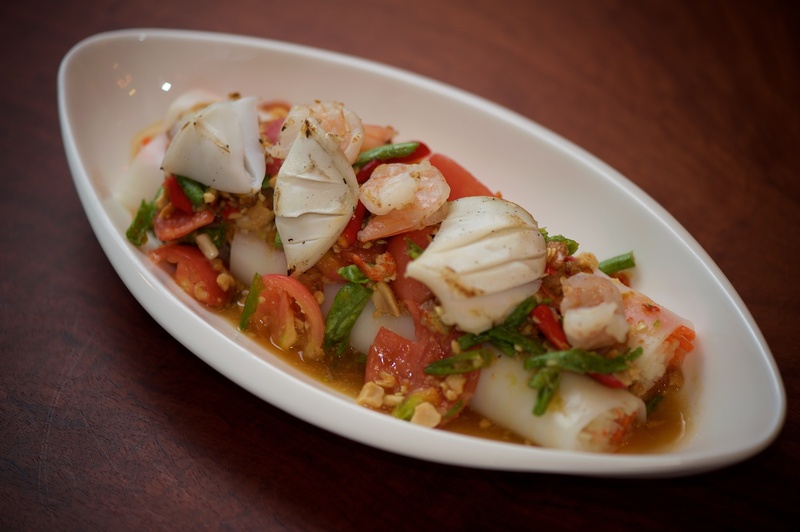 Whet your appetite with mouth-watering Papaya Salad with Seafood and Noodles (Bt250), for which Sarawat combines two Thai favourites – papaya salad (som tom) and rice-noodle rolls (kuay tiew lui suan). 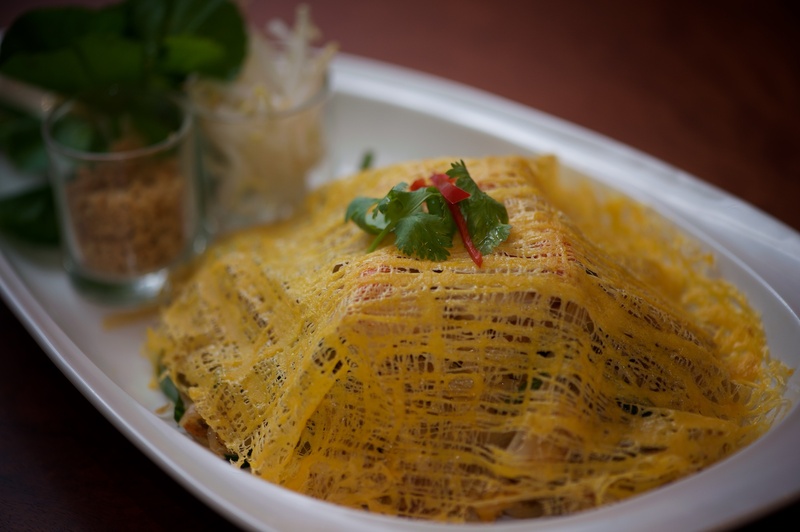 The shredded green papaya is wrapped in the noodle and tossed with chunks of seafood and a hot dressing in a dish that’s not just tasty but addictive. For something a little meatier, opt for Crispy Pork with Sesame (Bt170). Succulent pork belly is tossed with white sesame seeds for extra crunch and aroma and then deep-fried to golden crispiness. Forget about any prior experiences with fatty fried pork, because this is lean meat – just enough fat to keep it decadent. It’s served with two kinds of dips: Thai-style vinegar and chilli sauce and Chinese-style sweet soy sauce. 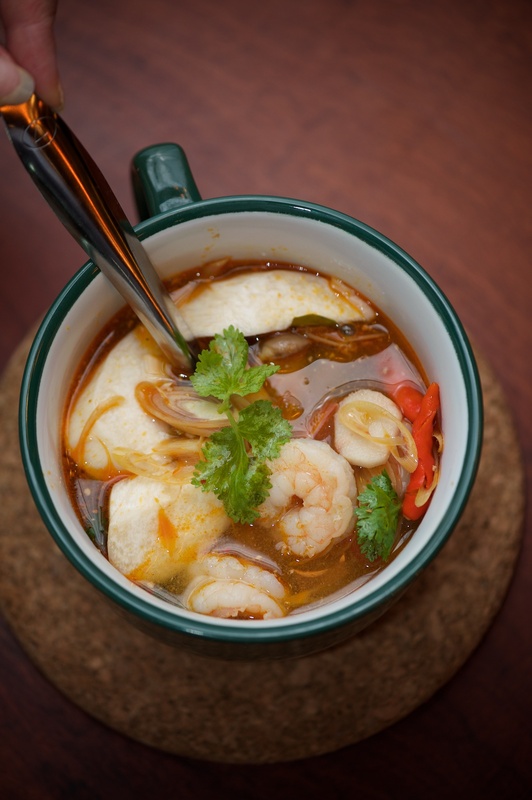 Tom Yum Goong (Bt250), another of Thailand’s famed international favourites, is served without frills but packed with flavour. The highlight is the fiery hot broth boasting a harmonious balance of tastes as well as that terrific herbaceous aroma. The shrimp paste oil (nam prik pao) adds a nice scent to the broth, making the thick, slightly creamy soup more even and palatable. Big, fresh and sweet prawns are thrown in, together with slightly chewy orinji mushrooms that turn out to be an interesting choice because they don’t get soggy. For quick power lunches, a sizeable plate of Pad Tai Goong (Bt220) comes in a crispy “egg net” with lots of crunchy bean sprouts. Other enticing dishes inclu de Sirloin Beef Spicy Salad, Soft-shell Crab Salad (each Bt250) and the excellent selection of Thai curries arriving with steamed rice. End your meal with a traditional Thai dessert, Banana in Coconut Milk (kluay buad shee, Bt80). This is half a ripe banana soaked in lime-infused water so it doesn’t get mushy and then cooked in creamy, sweet-salty coconut milk. It’s a simple, rustic treat that’s getting hard to find in Bangkok. The chef doesn’t make it too sweet, and adds to the texture and toasty aroma by sprinkling on black sesame seeds. Alternative desserts include Rice and Coconut Pudding (khanom krok) and Mango and Sticky Rice (each Bt120). The outdoor seating is ideal for people-watching. During happy hour from 5 to 7pm the cocktails cost Bt99 and Singha draft beer is a buy-one-get-one-free deal. Metta also serves a set lunch daily from 11 to 2 for Bt199. >>Metta Eatery & Bar is at the Maitria Hotel Sukhumvit – a Chatrium Collection on Sukhumvit Soi 18. >>It’s open daily from 6am until midnight. >>Call (02) 302 5777 or see www.Chatrium.com.